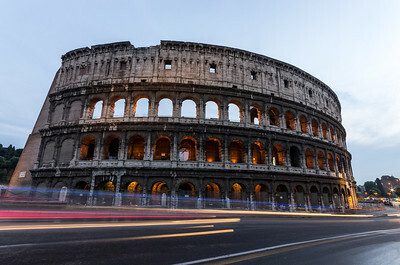 Built of concrete and stone, it was the largest amphitheatre of the Roman Empire, and is considered one of the greatest works of Roman architecture and engineering. 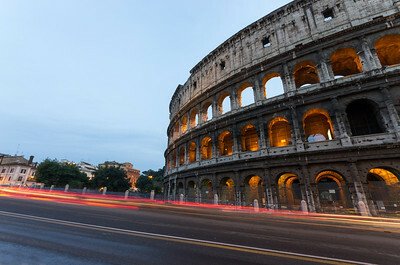 It is the largest amphitheatre in the world. The elliptical building is immense, measuring 188m by 156m and reaching a height of more than 48 meters. 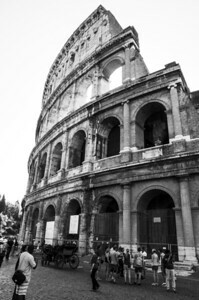 The magnificent structure was clad in marble and 160 larger-than-life statues graced the arches on the upper floors. 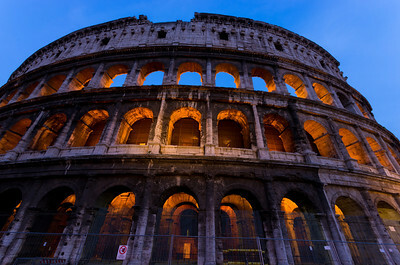 The Colosseum could accommodate some 55,000 spectators who entered the building through no less than 80 entrances. Above the ground are four stories, the upper story contained seating for lower classes and women. 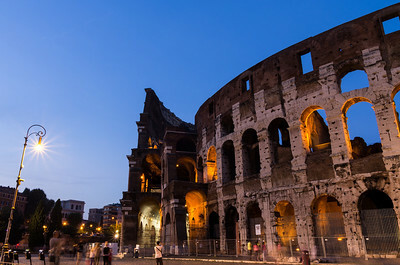 Coloseeeum built by the emperor Vespasian (r AD 69–79) in the grounds of Nero's palatial Domus Aurea, the Colosseum was inaugurated in AD 80. To mark the occasion, Vespasian's son and successor Titus (r 79–81) held games that lasted 100 days and nights, during which some 5000 animals were slaughtered. Trajan (r 98–117) later topped this, holding a marathon 117-day killing spree involving 9000 gladiators and 10,000 animals. The outer walls have three levels of arches, articulated by columns topped by capitals of the Ionic (at the bottom), Doric and Corinthian (at the top) orders. The external walls were originally covered in travertine, and marble statues once filled the niches on the 2nd and 3rd storeys. 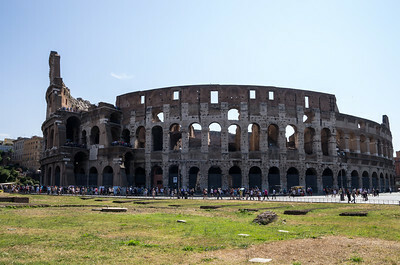 The upper level, punctuated with windows and slender Corinthian pilasters, had supports for 240 masts that held up a canvas awning over the arena, shielding the spectators from sun and rain. 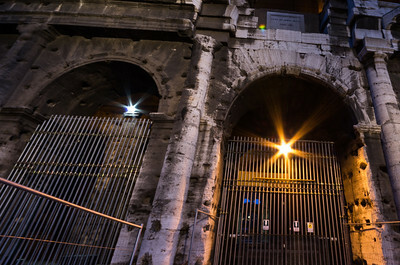 The 80 entrance arches, known as vomitoria, allowed the spectators to enter and be seated in a matter of minutes. 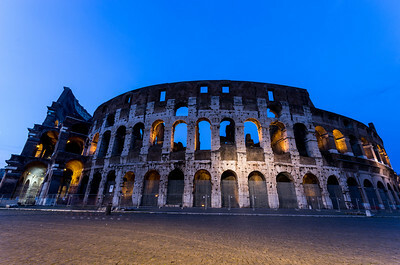 The Colosseum's interior was divided into three parts: the arena, cavea and podium. The arena had a wooden floor covered in sand to prevent the combatants from slipping and to soak up the blood. 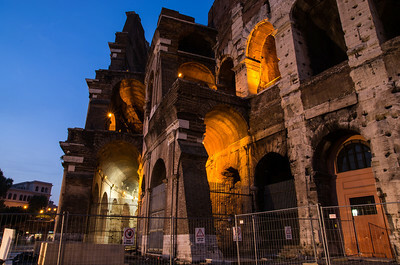 Trapdoors led down to the underground chambers and passageways beneath the arena floor – the hypogeum. Animals in cages and sets for the various battles were hoisted onto the arena by a complicated system of pulleys. 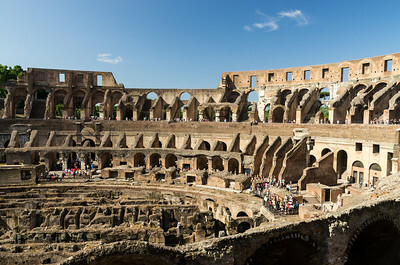 The cavea, for spectator seating, was divided into three tiers: knights sat in the lowest tier, wealthy citizens in the middle and the plebs in the highest tier. The podium, a broad terrace in front of the tiers of seats, was reserved for emperors, senators and VIPs. 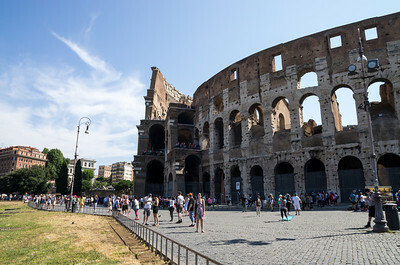 Just outside the Collosseum is the Arch of Constantine (Arco di Costantino), monument built in AD315 to mark the victory of Constantine over Maxentius at Pons Milvius. The arch is 21 m high, 25.9 m wide and 7.4 m deep. It has three archways, the central one being 11.5 m high and 6.5 m wide, the lateral archways 7.4 m by 3.4 m each. The top (called attic) is brickwork reveted with marble. A staircase formed in the thickness of the arch is entered from a door at some height from the ground, in the end towards the Palatine Hill. The general design with a main part structured by detached columns and an attic with the main inscription above is modelled after the example of the Arch of Septimius Severus on the Roman Forum. It has been suggested that the lower part of the arch is re-used from an older monument, probably from the times of the emperor Hadrian (Conforto et al., 2001; for a defence of the view that the whole arch was constructed in the 4th century, see Pensabene & Panella). The arch served as the finish line for the marathon athletic event for the 1960 Summer Olympics. This race won Abbe Bikila. He won in world record time (2:15:16) & becoming the first African to win an Olympic medal. Not only that, he did it barefoot (after they couldn't find a pair of shoes that fit him comfortably)!